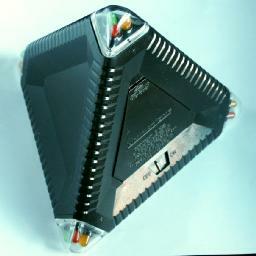 Luminations is an electronic puzzle in the shape of a tetrahedron, made by Random House in 1989. It has three coloured lights (red/green/yellow) at each of the four corners. There are 5 playing levels. Which level will be played depends on which corner is pointing up when the puzzle is switched on, and level 5 is only accessible when level 4 has been solved. When playing the game the corners will show various colours, and they change (depending on the level) when you rotate the puzzle letting a different corner point upwards. The aim is to make all the corners red. TO PLAY GAME 1: Place the pyramid so that the corner marked "1" is pointed up, and turn the power switch on. You're ready to begin tilting and turning! TO PLAY GAMES 2-5: Point the corner marked "2" up. Turn the power switch off and then on again. You're now ready to play level "2". Games "3" and "4" begin in the same way. Point the correct number up. Turn the power off and on again. Game "5" automatically begins when you win game "4". A short display of light and sound will occur between games "4" and "5". TO PLAY THE SAME LEVEL AGAIN: Begin tilting and turning the pyramid. This will stop the victory lights from flashing and let you play the same level again. This will work on all levels except level "4". Level "4" can only be replayed by turning the game off and then on again. REMEMBER... The object of the game is to make all four corners of the pyramid turn solid red at the same time! If your Luminations pyramid does not function properly, please call our customer service representative. Call Toll Free (800) 726-0600, except Alaska. In Maryland call (800) 492-0782. 24 hours per day - 7 days a week. It was patented by Donald C. Miffitt, Angelo Tortola, Charles S. Sebor and Robert L. Halliday (US 4,957,291, 18 September 1990). The solution I give below is split into two sections. The first section describes exactly how the lights react to your moves for each of the levels. The second section actually describes what moves to do to solve it. Rick Nungester's post in rec.puzzles with simple solutions to levels 1-4, and a deep analysis of the shortest possible level 5 solutions. Rick Nungester's post in rec.puzzles with simple solution to level 5. Colour: The state of a corner. Can be red, yellow, green, flashing one of those colours, but also could be off. Up: Pointing upwards. Bringing up a particular corner means turning the puzzle so that corner points up. Down: Not pointing upwards. There are always three down corners. The lights change through the following cycle of 5 colours: green, off, yellow, flashing green, red. A move changes only the light of the corner that is brought up. Each of the four corners is in one of 5 states, so seem to be 54=625 positions. Positions that differ only by a rotation of the puzzle around the vertical axis are really the same, so the real number is about a third of this. It is not exactly a third since some positions are symmetric, so we have not counted every position three times too often. Burnside's Lemma gives (54+2·52)/3 = 225 really distinct positions. If reflected position are also considered the same, then there are (54+3·53+2·52)/6 = 175. The lights change through the following cycle of 5 colours: flashing yellow, off, green, yellow, red. A move changes two lights - the one that is brought up and the one that is brought down. The number of positions is the same as in level 1, viz. 625, 225 or 175 depending on whether rotations and mirror image positions are considered to be the same. The lights change through the following cycle of 6 colours: green, flashing red, flashing yellow, flashing green, yellow, red. A move will change at most one corner light, the one that is brought up. It does not change however if that corner was up in either of the previous two positions before making that move. In other words, if you want to change the colour of the corner that is pointing up, you must bring that corner down, and do at least two more moves while keeping that corner down before moving it up again. Each of the four corners is in one of 6 states, so there are 64=1296 visibly different states that the puzzle can show. It is actually more complex due to the fact that it matters which corners were up in the previous two positions. We can assume that the puzzle is rotated around the vertical axis so that the previous up corner lies at the back. The up corner before that can be one of three possibilities, so there are really 3·64=3888 positions. If reflections are considered the same, then there are 2052. Note that at the start of level 3, corner 3 is up, so that when you do any move to get the random starting position and then move corner 3 up, it will not change. Either of the other two down corners will change when moved up. This means that although there are 3888 possible positions in level 3, only 1296 can occur as a random starting position. The lights change through the following cycle of 7 colours: yellow, off, flashing yellow, green, flashing red, flashing green, red. A move changes three lights, namely all except the one that is brought up. Each of the four corners is in one of 7 states, so seem to be 74=2401 positions. Positions that differ only by a rotation of the puzzle around the vertical axis are really the same, so the real number is about a third of this. It is not exactly a third since some positions are symmetric, so we have not counted every position three times too often. Burnside's Lemma gives (74+2·72)/3 = 833 really distinct positions. If reflected position are also considered the same, then there are (74+3·73+2·72)/6 = 588. The lights change through the following cycle of 9 colours: flashing green, flashing yellow, green, flashing red, off, yellow, green, flashing yellow, red. Note that green and flashing yellow occur twice, so it is not possible to distinguish the exact state of a corner if one of those colours shows. Any corner that is moved up will change, and it will also change during the next three moves. This is additive, so if you move up a corner that has already been up before in the last three positions, it will shift twice along the colour cycle. Every move therefore changes the lights a total of four cycle shifts - each corner shifts as often as that corner has been up in the new position and the previous three combined. Each of the four corners is in one of 9 states, so there are 94=1296 different states that the puzzle can show, though they are not all visibly different since green and flashing yellow occur twice in the colour cycle. It is actually even more complex than this due to the fact that it matters which corners were up in the previous two positions before a move. We can assume that the puzzle is rotated around the vertical axis so that the previous up corner lies at the back. The up corner before that can be one of three possibilities, so there are really 3·94=19683 positions. If reflections are considered the same, then there are 10206. Note that at the start of level 5 the two previous up corners are remembered from the end of level 4, i.e. the up corner one move before finishing level 4 and the up corner at the end of level 4 when all the lights flash. I have calculated through all positions of all levels, and the results are in the table below. Rick Nungester calculated level 5 before I did, and my results match his. The table shows that the levels can always be solved in at most 16, 14, 14, 24 and 22 moves respectively. For level 5 this does assume that the exact starting position is fully known. If there are ambiguous colours showing at the start this is not the case, so then an extra move will be needed to determine the actual state of the corners. It is interesting that the level 5 column contains only multiples of 3. This is because the positions come in sets of three which have different corner states, but if the effect of the previous up corners are taken into account they are actually the same. As soon as a single move is performed, the three positions become identical, i.e. if any particular move is performed on such a triplet, the result will be the same on all three. In Sloane's On-Line Encyclopedia of Integer Sequences these are included as sequences A080547, A080548, A080549, A080550, A080551, A080552, A080553, A080554, A080555, A080556, A080557, and A080558. Credits: The solutions given here are by Rick Nungester, originally made public in his newsgroup post in rec.puzzles. I merely condensed solutions 1, 2 and 4 into a single method, and provided an alternative solution to level 5. Keep hold of one down corner, and alternately bring the other three corners up, until you have two down corners of the same colour. Keep the two corners of the same colour down, and alternately bring the other two corners up, until the up corner matches the two equal down corners. If the fourth corner matches the other three, then skip the next step. Keep the mismatched corner down, and bring the other three corners up in turn, until all the corners are the same colour. 1. Hold the puzzle with one down corner pointing backwards, the other two down corners at the front left and front right. 2. Hold the front left corner in place, and turn the front right corner up. 3. Hold the front right corner in place, and turn the front left corner up. 4. Repeat 2 and 3. This brings up each corner in turn, and ends with the same corner up as before. Repeat this until all corners have turned red. Label the up corner A, and the other three B, C, D. Any move can now simply be denoted by the label of corner that is moved up. Do CADA. Repeat this as often as necessary to make B and C have the same colour. The sequence should be done at least once, and afterwards corner A should still be red. If D is not the same colour as B and C, then do BADACADA. Repeat if necessary until B, C, and D have the same colour. Corner A should still be red. If B, C, D are not red, then do BACADA. Repeat if necessary until all corners are red. The corners are labelled 1-4. Any move can simply be denoted by the label of corner that is moved up. If corner 2 is up, then move corner 1 up. Do moves 21, and then repeat until the top corner (corner 1) is flashing red. Do moves 32, and then repeat until the top corner (corner 2) is off. Do moves 43, and then repeat until the top corner (corner 3) is yellow. Do moves 1234, and then repeat until the top corner (corner 4) is yellow. This solution is my own. Repeat 12 1234 until corners 1 and 4 have the same colour. If they happen to be green or flashing yellow, you cannot be sure if they are the same, so then do moves 1234 again. If they are still the same colour then it's ok, otherwise do this whole step again. Repeat 2 1234 until 2 matches the colour of 1 and 4. If all three happen to be green or flashing yellow, then do 1234 again as before to make sure. Repeat 3 1234 until 3 matches the colour of 1, 2 and 4. Again you can make sure in the ambiguous cases of green or flashing yellow by doing 1234 again. This solution works by using the sequence 1234 to make sure the history of previous up corners remains the same, while only changing the corners all the same way (four steps along the cycle). By doing a move such as 2 or 3 first, only that corner is changed relative to the others. It is possible to combine steps, for example if none of 1, 2, 3 match 4 then 123 1234 will change all three relative to 4. Similarly, if in step c corner 2 already matches 4, then 13 1234 is more appropriate to fix 1 since it will disturb corner 3 instead of 2. The method for finding the shortest solution in level 5 is by Rick Nungester. I extended his methods to the other levels. The numbers you have now are the number of times that each corner has to be moved to the up position in order to make it red. It may be possible to find a sequence of moves that includes each corner the relevant number of times. For example, if corner 1 is pointing up and the colours of corners 1 to 4 are Yellow, Red, Off and Flashing Green respectively. Looking up the colours of corners in the list gives numbers 2,0,3,1, so then the move sequence 313134 will work for example. Note that such a sequence cannot have any corner repeated in two consecutive moves, and must begin with a different corner than the one that is currently up. It may not be possible to find such a sequence directly. Suppose the table gives the numbers 1,4,1,0 for the position you are trying to solve. You need to move corner 2 up four times, and you must alternate this with other moves, and there are only 1+1+0=2 of those, so it is not possible. In such a case, another corner must go through the whole colour cycle an extra time. Simply add 5 (the length of the colour cycle) to the smallest number of the corners, giving 1,4,1,5. This can be solved, for example 42424242431, or 34242424241. You may have to let two corners go through the whole cycle, e.g. if corner 1 is up and you have the numbers 2,1,0,0. The worst case occurs when all four corners need to be moved 4 times, giving a maximum of 16 moves to solve level 1. The numbers you have now are the number of times that each corner has to be changed in order to make it Red. Remember however that a corner is changed not only by moving up, but also by moving down. Since the corner that is up at the start is going to change once anyway when the first move is done, subtract one from its number to incorporate that effect already (and if it was already 0 then make it 4 instead). Similarly, each time a corner is moved to the up position it will change during that move and the next, so we might as well consider it to change twice as soon as it is moved up. The only exception of course is during the last move, since that corner won't be brought down again and so changes only once. Therefore, each move except the last decreases the number of the new up corner by two (and then add five if it becomes negative). Once you decide which corner will be moved up in the last move, a solution can be constructed. This is all a little complicated, so a simple way to do this is described next. To recap, you have the four numbers of the corners, where the number of the up corner has been decremented once to account for it changing when you do the first move. Now for each corner, choose a number pair from the relevant column in the following table, preferably a pair near the top of the column. The only condition on the 4 pairs you choose is that exactly one of them must have 1 as the second number. That will be the corner that is moved last. The first number of each pair is how often each corner must be moved (excluding that last move). For example, suppose corner 1 is up, and the corners show Yellow, Red, Yellow, Green respectively. These colours give the numbers 1,0,1,2, and when the up corner is decremented we get 0,0,1,2. We could choose the pairs (0,0)(0,0)(0,1)(1,0) which means that we must move up corners 3 and 4 once each, and do corner 3 on the last move, which gives the two move solution 43. A second example: Suppose corner 1 is up, and the corners show Green, Yellow, Green and Red respectively. These colours give the numbers 2,1,2,0, and when the up corner is decremented we get 1,1,2,0. We could choose the pairs (0,1)(3,0)(1,0)(0,0) which means that we must move up corners 1, and 3 once each, move up corner 2 three times, and that the last move must be corner 1. Unfortunately this is not possible, because there are not enough moves to alternate with the three moves of corner 2. We have already seen this occur in level 1 solutions, and the remedy is the same - we let one (or more) corners go through a whole cycle an extra time by moving it 5 times. This can be done in the table by choosing a pair lower down in the column. For example, (0,1)(3,0)(1,0)(5,0) and this gives a solution 4242424341. One final example, more complicated this time. Suppose corner 1 is up and is Off, and the other corners show Red. These colours give the numbers 3,0,0,0, and when the up corner is decremented we get 2,0,0,0. We could choose the pairs (1,0)(0,0)(0,0)(2,1) or (3,1)(0,0)(0,0)(0,0), but either case we find that no solution can be made because there are not enough moves to alternate with. Adding an extra cycle to one corner gives (1,0)(5,0)(0,0)(2,1) or (3,1)(5,0)(0,0)(0,0) but it turns out that this still gives trouble (remember that the last corner to move up must be the corner with a 1 as second number of the pair). In this case we must move two corners through a whole extra cycle, for example (1,0)(5,0)(5,0)(2,1) or (3,1)(5,0)(5,0)(0,0). This gives the 14 move solutions such as 23231234234234 or 32321321321321. The last example above shows the worst case, where two corners need an extra cycle, and this gives the 14 move longest minimal solution. The numbers you have now are the number of times that the colour of each corner has to be changed in order to make it red. I know of no perfect method to construct a solution from these numbers, instead I'll just give an example to show how it can be done. Suppose corner 4 is up, and the corners show flashing red, flashing yellow, flashing green, green respectively. Looking up these colours on the list gives 4,3,2,5. The worst corner is corner 4 which must change 5 times, so it must be moved up 5 times with at least 3 other moves between. If x denotes any as yet unknown move, then we need the move sequence to be xxx4xxx4xxx4xxx4xxx4. The first three moves are needed since corner 4 is currently up. The second worst corner is corner 1 which must move 4 times. Interweaving its moves gives x1x4x1x4x1x4x1x4xxx4. Similarly adding corner 2 three times gives 21x421x421x4x1x4xxx4, and then corner 3 gives 2134213421x4x1x4xxx4. Note that although corner 3 was up previously, after the first two moves it will be too long ago so that it will change when it is moved up on the third move. We now have a move sequence 2134213421x4x1x4xxx4 where all the specified moves should change the corner, and the as yet unknown moves marked x should not change anything. The x moves should therefore repeat a lot, and consist of moves that do not occur in the remainder of the sequence. The last gap of three x's can be partly filled for example by using corner 1 like this: 2134213421x4x1x41x14. The remaining gaps can be filled with 2's giving the solution 21342134212421241214. The numbers you have now are the number of times that each corner's colour has to be changed in order to make it red. This must now be converted to the number of moves needed for each corner. Sum the four numbers and multiply by 5. Then subtract each of the four numbers in turn, to get four new numbers, and take the remainders when divided by 7. These numbers show how often each corner has to be moved up. Suppose for example that corner 1 is pointing up, and looking up the colours of corners 1 to 4 in the list gives numbers 2,0,3,1 respectively. Then five times the sum is 5·(2+0+3+1) = 30, subtracting each number in turn gives 28,30,27,29, and casting out sevens gives 0,2,6,3. The level is then solved just the same as level one, so in this example we get the solution 32323434343 containing corner 3 six times, 4 three times and 2 twice. As another example, suppose that corner 1 is up and the colours are Off, Flashing red, Flashing green, and Flashing green respectively. The list gives the numbers 5,3,2,2. Then five times the sum is 5·(5+3+2+2) = 60, subtracting each number in turn gives 55,57,58,58, and casting out sevens gives 6,1,2,2. It is not possible to turn this into a solution directly because you need five moves with which to alternate the six corner 1 moves, and an extra move at the start to bring corner 1 down. There are only 1+2+2=5 moves available to do this with and this is not enough. One corner must therefore go through the whole cycle of 7 colours, so add 7 to one of the (small) numbers, to give 6,8,2,2. This gives for example the solution 212121212121234234. The worst case occurs when all four corners need to be moved 6 times, giving a maximum of 24 moves to solve level 4. When you finish level 4, remember which corner is up just before the last move. When the lights are flashing, start level 5 by moving one of the other two corners up. This ensures that in the three most recent positions (the current starting position and the two previous ones) three different corners have been up. Note that green and flashing yellow occur twice, so it is not possible to distinguish the exact state of a corner if one of those colours shows. You will then have to do a single move to see what the ambiguous colours change to in order to determine the exact state. Do this by moving up the corner that has not been up in the previous three positions, so that all four corners change their state, moving up in the list. A flashing yellow corner that becomes green for example must have been number 7 in the list, and because of your move has become number 6 in the list. The numbers you have now are the number of times that each corner has to be changed in order to make it red. Remember however that a corner is changed not only when it moves up, but also in the next three moves after that. You know what corners have been up in the previous positions so we can account for the changes that they will inevitably undergo during the next three moves. Subtract three from the number corresponding to the current up corner (and add nine if you get a negative number). Similarly subtract 2 from the number corresponding to the previous up corner, and subtract one from the up corner before that. For example, suppose that the random position shows red, yellow, green and green on corners 1-4 respectively, that corner 3 is up, and that the previous up corner was corner 2 and before that corner 1. There are ambiguous colours showing, so you must make a move to determine their real state. Corner 4 has not been up recently, so move it up. Suppose that corners 1-4 now show the colours flashing green, green, flashing yellow, and flashing red. Looking these four colours up in the list, we get 8,2,1,5. This is uniquely determined because for each corner we now the current colour and also the previous one. Corner 4 is up now, and before that were corners 3 and 2. To account for their future changes we subtract 3,2,1 from corners 4,3,2 to get 8,1,8,2 for the real current position. Each time a corner is moved to the up position it will change during that move and the next three, so we might as well consider it to change four times as soon as it is moved up. The exception of course is during the last three moves. Therefore, each move except the last three decreases the number of the new up corner by four (and then add nine if it becomes negative). Once you decide which corners will be moved up in the last three moves, a solution can be constructed. This is all a little complicated, so to simplify this process a table can be used as described below. For each corner, choose a number pair from the relevant column in the following table, preferably a pair near the top of the column. The only condition on the 4 pairs you choose is that the second number in the pairs should all be different. That second number determines the order of the last three moves, and the first number of each pair is how often each corner must be moved not including the last three moves. In our example we have the numbers 8,1,8,2. We could choose the pairs (2,0)(2,2)(4,1)(2,3) which means that we must move up corners 1, 2 and 4 twice each, corner 3 four times, and afterwards as the last three moves do 423. This gives the solution 3131432432423. This method does assume that the solution uses at least 3 moves. If you want to be sure to find the shortest solution, then you would have to check first that there is no one or two move solution.